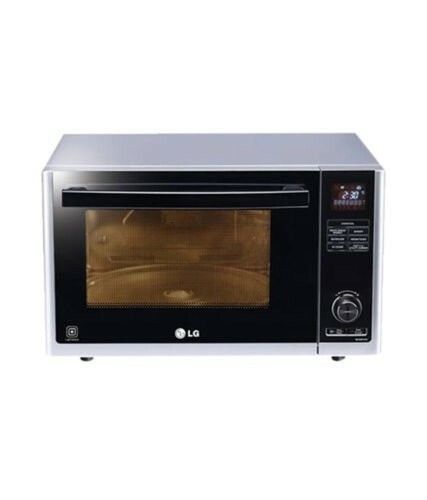 LG 32 L Convection Microwave Oven (MJ3283CG, Silver) carries a bunch of unique features, which are often not found in normal microwave oven. In unique features, there are a charcoal lighting heater and light wave technology. MJ3283CG unit comes with required accessories such as a rotating ring, a glass tray & tawa, rotisserie bar & handle, cook book, recipe manual and owner’s manual. This LG MJ3283CG is claimed as the number one charcoal lighting heater. This efficient heater lets you prepare food with the help of a proficient charcoal filament to save time and to deliver delicious and healthy meals. This charcoal heater greatly manages water heat concentration, consequently it cooks more naturally and efficiently than others. Further, it has Active Convection feature that works by placing 4 heaters, two on top and two at rear end for wider and even cooking. This feature is also an energy saver by adjusting convection fan and heat of the grills. LG MJ3283CG microwave oven has motorized rotisserie, which is a steel barbeque that works on motor system to deliver good grilling result. Amazingly, this LG convection microwave oven has multi-function cooking capabilities. It combines 4 different cooking modes to deliver juicy and delicious foods. On the other hand, it doesn’t take much space to be installed in your small kitchen. The four cooking modes are convection, grill, solo and combination.